During today’s Senate Armed Services Committee hearing on women in combat two top generals said that women should be required to register for the Selective Service, along with men, as the branches begin to integrate women into combat roles. “I think that all eligible and qualified men and women should register for the draft,” General Robert Neller, the commandant of the Marine Corps, told the Committee. Neller’s position was echoed by Army chief of staff General Mark Milley. Navy Secretary Ray Mabus and Acting Army Secretary Patrick Murphy were less willing to move quickly on requiring women to register, suggesting instead that there should be discussion of legislation that would eventually alter the current rules. The White House said the comments did not reflect a policy change. “I don’t know how seriously that is being considered,” press secretary Josh Earnest said. Excluding women from a draft reinforces a stereotype that they are less capable than men and need to be protected. That sentiment was echoed today by Representative Martha McSally (R-AZ), a retired Air Force Colonel who was the first woman to fly in combat. “Our country is about treating people as individuals and having a meritocratic approach. ... The debate is over. Women are in combat. Women have been in combat,” McSally told Reuters. She added, however, that changing the registration requirements could have a profound impact on the Selective Service, including eliminating it altogether. “I’m not sure how that will go,” McSally added. 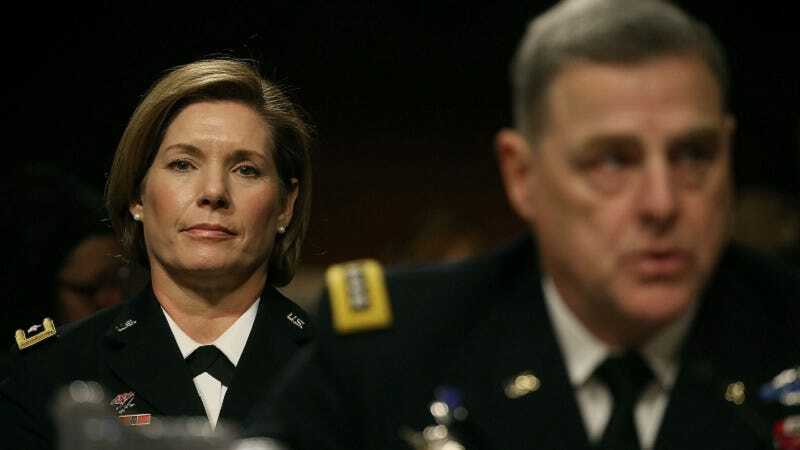 Major General Laura Richardson during today’s hearing. Image via Getty.